Are you too busy or incapable of properly maintaining your home? There is no shame in that. Sometimes (most of the time!) life gets in the way. That is why Homestead Services was conceived. Stay in your home longer! Homestead Services helps Seniors stay in their homes longer and enjoy what they have built over the years. With Homestead Services, this dream can become a reality for people who can't care for their homes like they used to. We maintain, thus easing your burdens. Home repairs and maintenance in 108 Mile Ranch and surrounding area was just what was needed. Let us take care of your yard and garden so you can simply enjoy it. The highest quality insured lawn care in the 100 Mile Area! Our yard and garden maintenance will take care of everything from trimming to weeding to ensuring that your garden is healthy and producing beautiful flowers, tasty vegetables and sweet fruits. 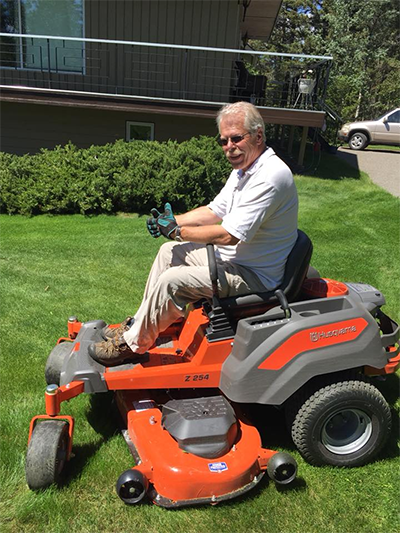 We provide professional lawn care that includes mowing, trimming, edging and blowing. Edging the lawn along sidewalks and driveways is optional but it gives the lawn a professionally manicured look. Power Raking is a very effective way to remove thatch, moss, and dead debris that build up on your lawn over time without causing any significant damage. We highly recommend Power Raking in the early spring before any new growth has begun in your lawn. It's also a great service to combine with overseeding, as it opens the lawn surface so that new seed can get quickly established. We can overseed your lawn with annual rye grass for a green lawn all winter. Soil aeration is the mechanical removal of small cores of soil from the lawn using an aeration machine. 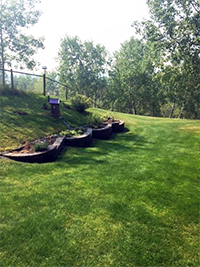 It is often described as the most important thing you can do to create a healthy, thick, and robust lawn. To control moss the approach must include chemical treatment to eliminate the moss already established and cultural treatments to prevent re colonization. Chemical treatment is only temporarily effective if growing conditions for grass are not improved. If your soil is acid (pH less than 6) and needs to be limed, Liming in spring or fall will give the best results. If a large dose of lime is required, it can be divided into two applications over two seasons. If your lawn is mowed and watered properly, and has had lime added as needed, you may not need to use fertilizer. However, soil that is low in nitrogen needs fertilizer to compensate for losses caused by mowing. Your lawn should be fed at least twice a year. This is a great way to keep your landscape looking clean and kept. Shrub and hedge trimming or pruning should be done at least twice a year to help maintain the size and shape of your plants. Tree trimming is important for many reasons. Cutting away dead and diseased branches will reduce the possibility of further damage and loss for your trees. 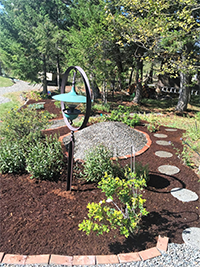 This service is provided in order to keep the customer's landscape beds looking clean and weed free. Weeds, not only unattractive, can hinder the growth of your surrounding plants. There are many ways to utilize this service. It can be done weekly, monthly, or by call basis. Herbicides are often the easiest for weed control, especially with high weed populations. These areas need to be controlled since they will shade and eventually crowd out much of the grass seedlings. We apply granular pre-emergent to your flower beds. This will help control unsightly weeds among your ornamentals. This product will not completely eliminate 100% of your weed problem, but will allow you more time to enjoy your flowers instead of pulling weeds around them.